As two of the cards used in today's review (the ASUS GTX260 TOP and MSI GTX280) are factory overclocked, it would be unfair to directly compare these to the stock-clocked PowerColor HD4870 without giving the card some additional overclocking of its own. Therefore, in the results over the next few pages you will see the HD4870 results alongside a set of "HD4870 OC" results which have been performed at the core/memory speeds shown in the overclocking section below. During the benchmarking phase, we will be using the following prices extracted from aria.co.uk on 22/07/08 to produce our CPF graphs. Please remember that these graphs are static and only represent a snapshot of the market at the time of this review. 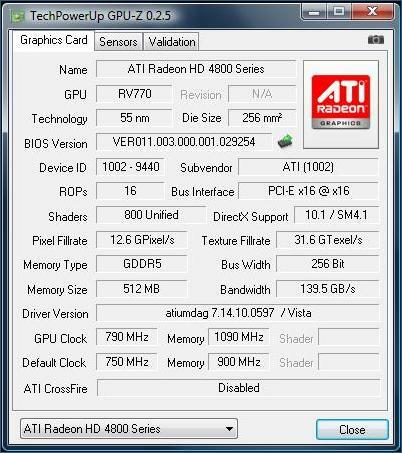 Using only the the ATI Overdrive™ facility built into the driver control panel, the maximum overclock we were able to obtain from the HD4870 was 790mhz on the core and 1090mhz on the memory. With further fine tuning and a utility such as ATITool that allows selection of settings much higher than this, we are confident that the PowerColor HD4870 could have done even better.